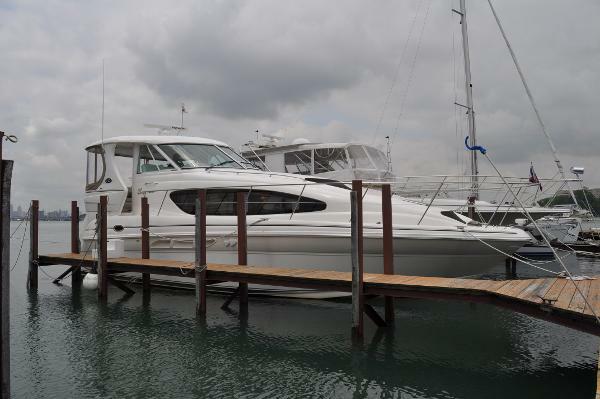 2005 Sea Ray 390 Motor Yacht This Sea Ray Motor Yacht is in showroom condition, very low use, and captain maintained. Building on their reputation for design innovation, Sea Rays 390 Motor Yacht differs from traditional motor yachts in that the helm and aft deck of the 390 are on the same level. The advantage of this layout is that it keeps the captain in the social center of the boat rather than isolated on a fly bridge. From the standpoint of comfort, the 390 receives high marks for her spacious interior and luxurious accommodations. The light-filled salon is accented with high-gloss cherry cabinetry and leather upholstery, and a high/low table with stools and a breakfast bar provide dining space. The galley, which is down from the salon level, benefits from the natural light that flows from an overhead skylight. Topside, an extended hardtop shelters the aft deck with its wet bar, acrylic wing doors, and bench seating. A stairway with a safety railing leads down to the swim platform. 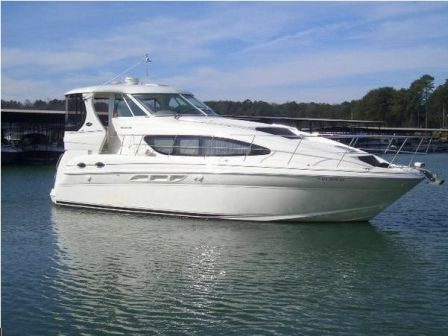 2005 Sea Ray 390 Motor Yacht !! 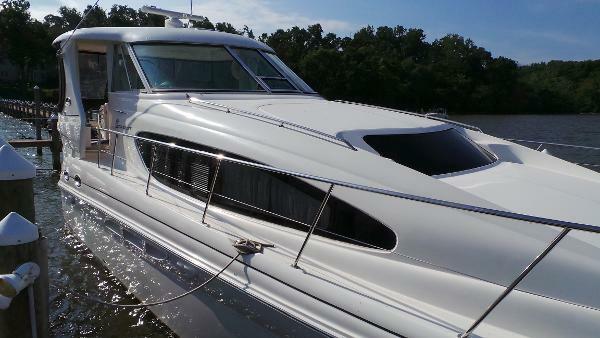 This is the cleanest 390 Sea Ray Sundancer out there !! !! Fresh Water Only Boat Always. Stored Indoors !! 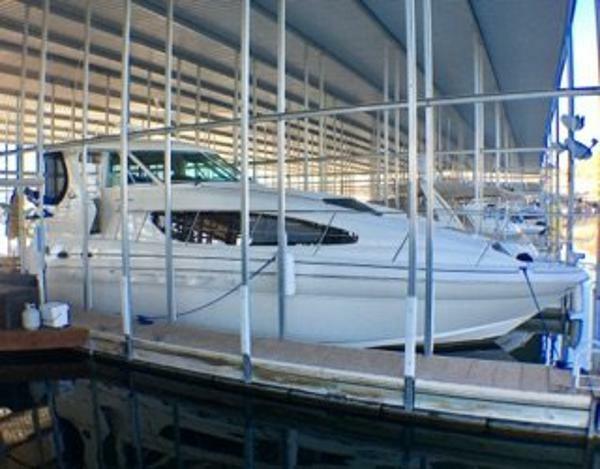 390 Sea Ray Sundancer has been properly maintained with an open checkbook, fresh water kept and stored indoors for the winters. If you are looking for new without the new price, you just found your boat. Twin Cummins 6CTA 8.3-M 480hp Diesels 980 hours Remote Control Auto Pilot from any location on the boat Solar Panel Batteries. Stay powered for 3 days out. 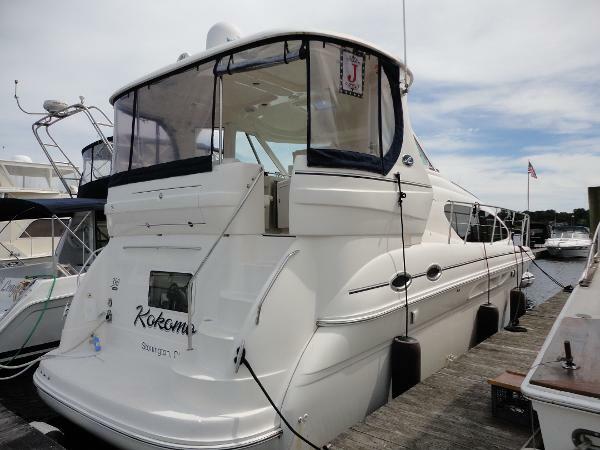 Air Conditioning / Heat Washer Dryer Custom Thicker Trim Tabs (do not bend) Generator Onan 9kw 300 hours 25 Knot Cruise Owner will consider a 33 to 35 Sea Ray Sundancer trade. 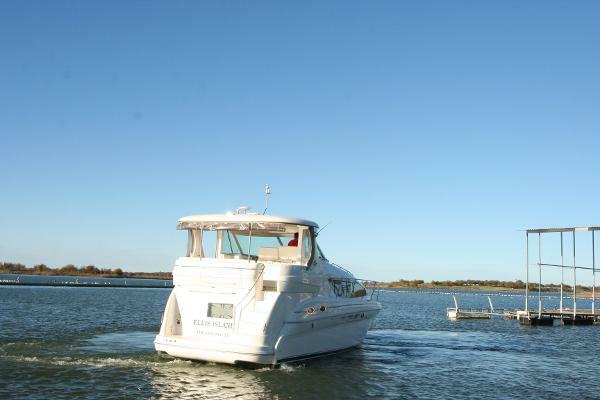 Please contact us today for more information or to arrange a showing on this yacht. 2005 Sea Ray 390 Motor Yacht This Sea Ray 390 is a well maintaintned Motor Yacht With Twin 480 HP 6CTA 8.3-M Cummins Diesels (980hours). It has Raymarine standard electronic radar, chart plotter, auto pilot with remote control, Onan generator 3 cy 220 vt / 60 cycle 9kw with (300 hours). 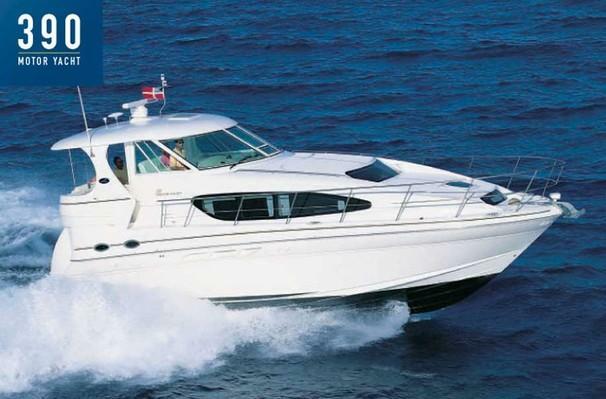 This vessel cruises at 20 knots with ease and tops out at 30knots 2400rpm. The Sea Ray 390 Motor Yacht is one of the best layouts for enjoying being on the water or in the marina. The helm with a double helm seat has excellent visibility and the spacious aft deck with lots of seating, wet bar with fridge all only few steps away. There's no forward canvas to fool with, and clear doors to the side decks with high SS rails all the way forward to the anchor/windlass and back. Access from the aft deck to the swim platform and swim ladder is down a few steps with sturdy handrail - secure and safe. This is a well-designed motor yacht for having fun on the water whether entertaining a crowd or enjoying a romantic evening under the stars. Entering the salon from the helm through a solid cabin door and down a few steps you enter into an open and airy space with lots of beautiful wood trim and cabinets, luxurious plush seating, and stunning blend of beautiful fabrics, surrounded by large windows for great natural light and broad views. Forward and a few steps down is an almost as beautiful fully equipped galley with lots of natural lighting and storage, and a beautiful rich hardwood floor. Lift the steps with the gas assist struts and the washer/dryer combo is conveniently right there ready to handle a load of beach towels and t-shirts. The forward cabin has a double bunk arrangement with one bunk being a double. Across form the galley is a large full sized head equipped with a well-lit vanity and sink, vaccuflush, and a separate shower enclosure. Saving the best for last is the full beam master aft cabin is accessed from the back of the salon through a solid hardwood door for privacy. The beautiful custom cherry built in furniture is gorgeous while being very functional. A large island bed with night stands on both sides, with luxurious fabrics, more wood trim, and large window. Add the ensuite separate head and shower compartments and you have your own private oasis. 2005 Sea Ray 390 Motor Yacht Beautiful 2005 Sea Ray 390 Motor Yacht is a timeless classic, built with the legendary Sea Ray commitment to quality and style. Pristine,showroom condition best describes this professionally maintained motor yacht, every option she is loaded, low hour boat ONLY 360. Twin Cummings 480CE with 450HP EACH! 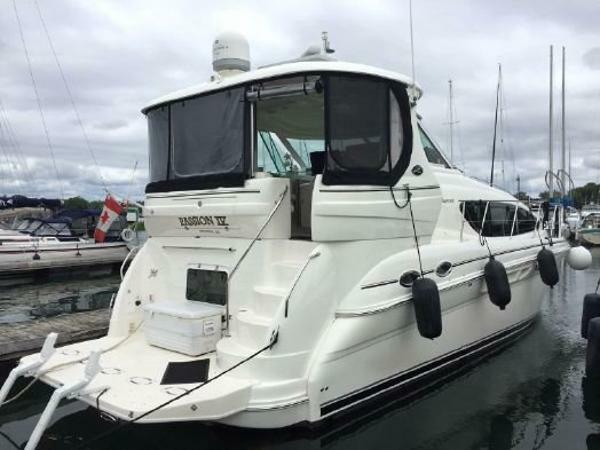 9.0 KW Diesel Generator, Sea Ray Nav II, Color GPS/CHART PLOTTER, Bow Thruster, Auto Pilot, Cockpit AC/Heat. This is the cleanest boat it literally smells like brand new!! 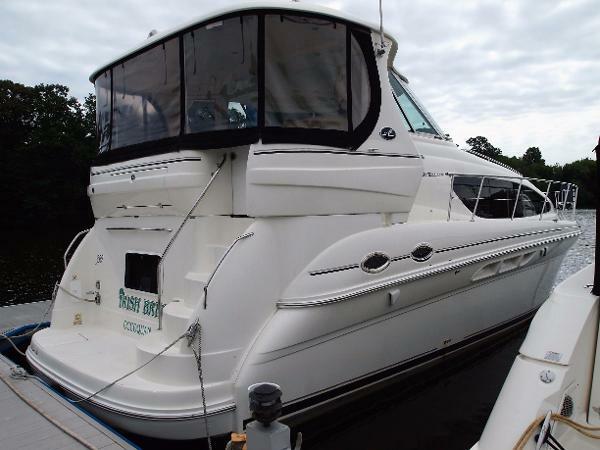 2005 Sea Ray 390 Motor Yacht Very Clean, Fuel efficient, Great lines, Low Hour Cummins Diesel Power, Bow Thruster, Full Beam Master, Great A/V System. What else could you want? Motivated Seller wants her gone. Call, text or email to make a deal in time for Christmas Break. 2003 Sea Ray 390 Motor Yacht The Sea Ray 390 Motor Yacht features smooth lines, a roomy interior, smart engineering, and a breathtaking cockpit view. The power of twin 8.1 S Horizon MerCruiser gas inboards will have owners on their way in no time. 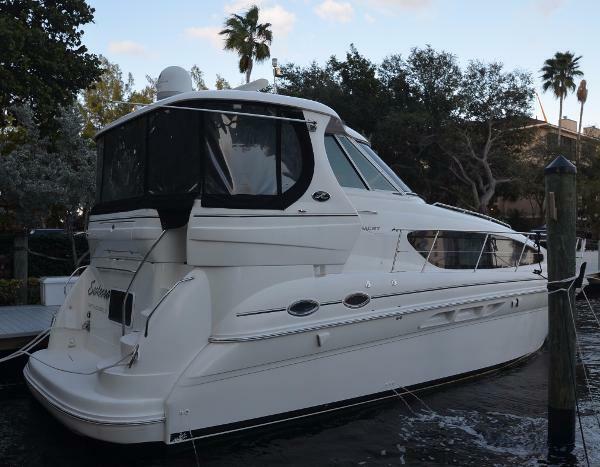 2005 Sea Ray 390 Motor Yacht Unbelievably clean and cared for Sea Ray 390 MotorYacht! Moored in the shade since new and she has been land locked on our small AZ lake since launched. Owned by a true Yachtsman. Serviced every season by the professionals. This vessel will show better than any other on the market. Equipped with twin 8.1s Mercs only showing 327 hours of run time. "Knot Aft Bad" is the used vessel you would consider. Optioned with Bow Thruster, Cockpit AC, Sat TV, C120 Raymarine Plotter, GPS and Radar, Upgraded Speakers, Amps and Sound System. 6 TVs, DVD Players, VHF player, Central Vac, Washer/Dryer Combo, Cherrywood, Newer Canvas curtains with Zip out Isinglass with Screens. Spotlight, Dingy Mount on the swimdeck and custom made carpet runners throughout. Building on their reputation for design innovation, Sea Rays 390 Motor Yacht differs from traditional motor yachts in that the helm and aft deck of the 390 are on the same level. The advantage of this layout is that it keeps the captain in the social center of the boat rather than isolated on a flybridge. From the standpoint of comfort, the 390 has received high marks for her spacious interior and luxurious accommodations. The light-filled salon is accented with high-gloss cherry cabinets and leather upholstery, and a high/low table with stools and a breakfast bar provide dining space. The galley, which is down from the salon level, benefits from the natural light that flows from an overhead skylight. An optional washer/dryer is found under the steps that lead from the galley to the salon. Topside, an extended hardtop shelters the aft deck with its wet bar, acrylic wing doors, and bench seating. A stairwaywith a safety railingleads down to the swim platform. 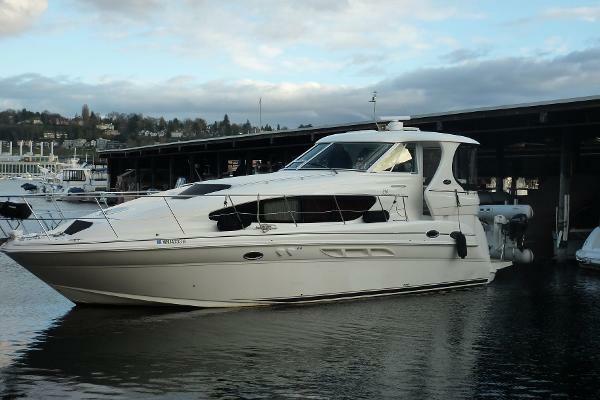 2004 Sea Ray 390 Motor Yacht Unbelievably clean and cared for Sea Ray 390 MotorYacht! Moored in the shade since new and she has been land locked on our small AZ lake since launched. Owned by a true Yachtsman. Serviced every season by the professionals. This vessel will show better than any other on the market. Equipped with twin 8.1s Mercs only showing 327 hours of run time. "Knot Aft Bad" is the used vessel you would consider. 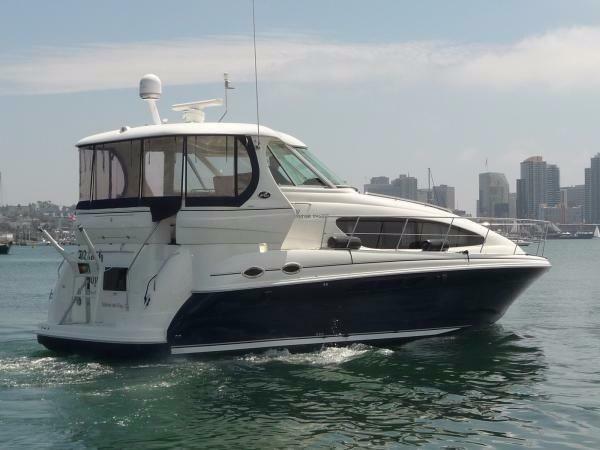 Optioned with Bow Thruster, Cockpit AC, Sat TV, C120 Raymarine Plotter, GPS and Radar, Upgraded Speakers, Amps and Sound System. 6 TVs, DVD Players, VHF player, Washer/Dryer Combo, Cherrywood, Newer Canvas curtains with Zip out Isinglass with Screens. Spotlight, Dingy Mount on the swimdeck and custom made carpet runners throughout. Building on their reputation for design innovation, Sea Rays 390 Motor Yacht differs from traditional motor yachts in that the helm and aft deck of the 390 are on the same level. The advantage of this layout is that it keeps the captain in the social center of the boat rather than isolated on a flybridge. From the standpoint of comfort, the 390 has received high marks for her spacious interior and luxurious accommodations. The light-filled salon is accented with high-gloss cherry cabinets and leather upholstery, and a high/low table with stools and a breakfast bar provide dining space. The galley, which is down from the salon level, benefits from the natural light that flows from an overhead skylight. An optional washer/dryer is found under the steps that lead from the galley to the salon. Topside, an extended hardtop shelters the aft deck with its wet bar, acrylic wing doors, and bench seating. A stairwaywith a safety railingleads down to the swim platform. 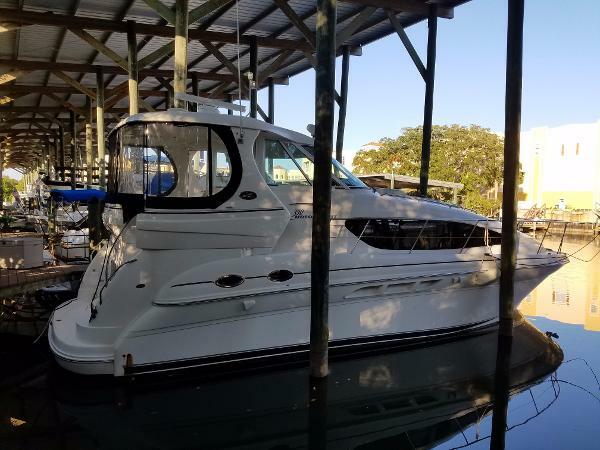 2005 Sea Ray 390 Motor Yacht This Sea Ray 390 MY has all the popular options including the Mercruiser T8.1 HO (330 hours), full Raymarine C120 radar/GPS/chartplotter, Raymarine ST7001 Auto Pilot, SmartCraft, Vetus bow thruster, Raymarine VHF, Clarion Audio system, helm/aft deck AC/HT, The Sea Ray 390 Motor Yacht is one of the best layouts for enjoying being on the water or in the marina. The helm with a double helm seat has excellent visibility and the spacious aft deck with lots of seating, wet bar with fridge all only few steps away. There's no forward canvas to fool with, and clear doors to the side decks with high SS rails all the way forward to the anchor/windlass and back. Access from the aft deck to the swim platform and swim ladder is down a few steps with sturdy handrail - secure and safe. This is a well-designed motor yacht for having fun on the water whether entertaining a crowd or enjoying a romantic evening under the stars. Entering the salon from the helm through a solid cabin door and down a few steps you enter into an open and airy space with lots of beautiful wood trim and cabinets, luxurious plush seating, and stunning blend of beautiful fabrics, surrounded by large windows for great natural light and broad views. Forward and a few steps down is an almost as beautiful fully equipped galley with lots of natural lighting and storage, and a beautiful rich hardwood floor. Lift the steps with the gas assist struts and the washer/dryer combo is conveniently right there ready to handle a load of beach towels and t-shirts. The forward cabin has a double bunk arrangement with one bunk being a double. Across form the galley is a large full sized head equipped with a well-lit vanity and sink, vaccuflush, and a separate shower enclosure. Saving the best for last is the full beam master aft cabin is accessed from the back of the salon through a solid hardwood door for privacy. The beautiful custom cherry built in furniture is gorgeous while being very functional. A large island bed with night stands on both sides, with luxurious fabrics, more wood trim, and large window. Add the ensuite separate head and shower compartments and you have your own private oasis. 2003 Sea Ray 390 Motor Yacht (ORIGINAL OWNER) LIGHT USAGE AND NICELY EQUIPPED, PRIDE OF OWNERSHIP SHOWS THROUGHOUT THIS 2003 SEA RAY 390 MOTOR YACHT -- PLEASE SEE FULL SPECS FOR COMPLETE LISTING DETAILS. LOW INTEREST EXTENDED TERM FINANCING AVAILABLE -- CALL OR EMAIL OUR SALES OFFICE FOR DETAILS. Freshwater / Great Lakes boat since new this vessel features Twin Cummins 480CE 446-hp Diesel Engine's with only 500 original hours. Notable features include but are not limited to the following: Air-Conditioning & Heat (4-Units), (2) Heads (Vacuflush) w/Vanity/Sink/Stall-Shower's, Central Vacuum System, Washer/Dryer, Canvas Carpet Runners, Onan Generator, Windlass Anchor w/Forward Pedal Controls (Freshwater Wadhown @ Windlass), Cockpit AC/Heat, Bow Thruster, Raymarine Electronics Package (VHF Marine Radio, RL80C Radar, Autopilot, Sea Ray Color Navigator System), SmartCraft System, Cockpit Wet Bar w/Sink/Ice-Maker, and MUCH more! Broker Notes: Shows in above average condition. Inside heated winter stored since new. Sale includes owners manuals. Highly recommended by listing agent. The PowerBoat Guide had this to say: Building on their reputation for design innovation, Sea Ray’s 390 Motor Yacht differs from traditional motor yachts in that the helm and aft deck of the 390 are on the same level. The advantage of this layout is that it keeps the captain in the social center of the boat rather than isolated on a flybridge; the disadvantage is seen in the 390’s ungainly, full-bodied profile. From the standpoint of comfort, however, the 390 receives high marks for her spacious interior and luxurious accommodations. The light-filled salon is accented with high-gloss cherry cabinets and leather upholstery, and a high/low table with stools and a breakfast bar provide din- ing space. The galley, which is down from the salon level, benefits from the natural light that flows from an overhead skylight. An optional washer/dryer is found under the steps that lead from the galley to the salon. Topside, an extended hardtop shelters the small aft deck with its wet bar, acrylic wing doors, and bench seating. A stairway—with a safety railing—leads down to the swim platform.